At Freelance Aircrew we are a team that know the industry. We have been frustrated as Aircrew always getting requests to do freelance work when it doesn’t suit us and as operators having to spend time and effort trying to find pilots and crew at short notice. The solution is Freelance Aircrew. 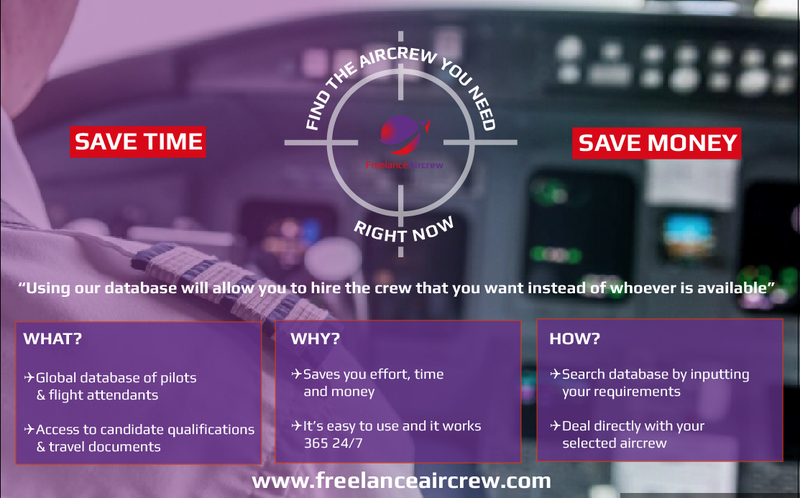 A global database where Aircrew are in control of their availability and a solution that saves employers time, money and effort when trying to fill short-notice crewing requirements. It’s easy to use and it works. As an employer who needs aircrew you can conduct a search for free. Once you have found the crew you need, you can subscribe to our service to gain crew training records, travel documents (passport/visa) and contact details...from here on in it is up to you to deal directly with the crew to arrange the details. There are no hidden fees and you can use the database as often as you like within your subscription period. We have 1000s of pilots and flight attendants waiting to be contacted. Choose the crew that you want rather than who is available. Choose Freelance Aircrew.